For more on local democracy and its relationship to the Pluralist Commonwealth, see Chapter 12 of American Beyond Capitalism. In the spirit of traditional theorists like Alexis de Tocqueville and John Stuart Mill—and modern writers like Benjamin Barber, Jane Mansbridge (and, in certain areas, anarchist-oriented theorists like Murray Bookchin and Noam Chomsky)—the Pluralist Commonwealth vision rests firmly on the principle that over the long haul rebuilding local democracy with a ‘small d,’ from the bottom up, is a necessary requirement of renewing the basis of meaningful Democracy with a ‘big D’ in the political-economic system as a whole. It also is based on the principle that reconstituting a culture of community—that “we are all in it together”—is a necessary precondition of solving many of our national problems. This in turn requires recognition that it is not enough to simply move in the direction of new, democratic economic institutions. The entire community also includes stay-at-home spouses, the elderly, the young, the infirm and many other members of the community not defined simply by their role at the workplace. 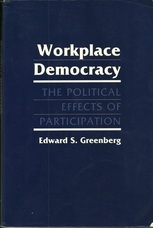 A classic study of the plywood cooperatives is: Edward Greenberg, Workplace Democracy: The Political Effects of Participation (1986). Studies of American worker-owned plywood cooperatives also suggest the importance of exploring different community-integrated models for larger firms that may move in such a direction—and they pose additional questions concerning the cultural implications of some forms of worker-ownership which may generate narrowly focused political and cultural norms that do not necessarily support a larger community-sustaining culture. A critical element of a community-sustaining system is also its capacity to nurture new roles for men, women and people of different sexual orientation—and especially those who wish to raise families and participate in community life. This is not simply a matter of attitude; it is a matter of altering the spatial and institutional way in which communities are oriented—a subject rarely explored in narrowly ‘economic’ models. For more on community and the non-sexist city, see Chapter 13 of America Beyond Capitalism. See also: Making a Place for Community. "Capital Stability and Local Democracy," Dollars and Sense, 2002. "The Reconstruction of Community Meaning," Tikkun, 1996. "Socialism Based in the Community," The Nation, 1991. "The Common Good: Stalemate or Reconstruction," Alternatives, 1986. "The World According to Gar," In These Times, 1979.